Who says catering has to follow a preset template? Sure, there are benefits to following a tried and true path when it comes to event planning, but taking the road less traveled has its own rewards. When you’re looking for catering options in St. Cloud, consider going custom. As far as custom options go, we’ve already talked about going miniature, but what about using America’s favorite utensil? No, I don’t mean your standard cutlery or even the spork. I’m talking about the stick. The stick? Yes, the stick. This go-to utensil has been feeding the masses at fairs and festivals for decades, and it’s about time food on a stick made its mark in central Minnesota catering. Why Put Your Meal on a Stick? 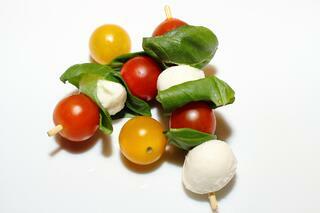 There are plenty of reasons to serve food on a stick at your next catered event. 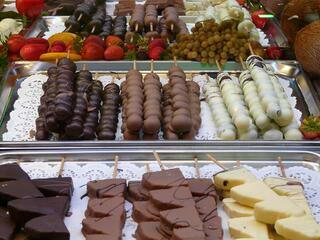 For starters (pun intended), food on a stick instantly reminds someone of outdoor fairs and festivals. This connection brings up old memories and nostalgia for guests of all ages. Food on a stick typically means plates and silverware aren’t needed. Additionally, they allow your guests to move about a venue or location more freely, and food on a stick is common in many cultures throughout the world. Finally, serving food on a stick adds an extra layer of fun to familiar foods. Although dining a la stick might drum up memories of deep-fried delicacies, know that you can achieve the carefree whimsy of food on a stick without opting for fried foods. Consider the following appetizers, entrees, and desserts when you consider your next catered event. Perhaps the most stick-friendly category, many appetizers seem like an ideal food to serve this way. Think about the beautiful simplicity of caprese salad, stuffed olives, fresh fruit, or artisan cheeses thoughtfully skewered for simple grab-and-go access. For entrees, kebobs are a great way to get all your protein and vegetables in one package. You can go classic with cubed steak, peppers, and potatoes. Or, skewer scallops with zucchini to put a sophisticated twist on the classic kebob. You could also adopt the fair-favorite pork chop on a stick accompanied by skewered baby potatoes. While many guests can turn down a whole serving of dessert, offering bite-sized options can increase their willingness to indulge. For instance, replace the typical sheet cake or cupcakes with cake pops and watch your guests enjoy. Fruit skewers also work well for a lighter dessert option, otherwise dip fruit skewers in chocolate for the best of both worlds. I hope you consider food on a stick the next time you think about catering ideas. Not only are they an opportunity to delight your guests, they can also be a practical addition to many events.